We are in the first week of our school summer holidays and to say Ethan is unsettled is an understatement. It isn’t only the summer holidays that unsettle him, it’s any school holiday that is over a week-long. The school try to keep the children in a routine as much as possible. This means the holidays aren’t really mentioned but Ethan somehow becomes aware that they are coming a few weeks before. For us this means even less sleep than normal. If Ethan is unsure of what is happening he will wake up every hour and sometimes not sleep at all. He also gets even more controlling of the things he can control. This then results in more meltdowns. For example he will control where he wants to eat. He has stopped eating his breakfast at the table and I have to feed it to him in the front room. He is controlling what we watch on the TV. It has to be Disney Junior when he is up even though he doesn’t watch it because he is on his iPad! To try to reduce Ethan’s distress I have decided to go back to basics and reintroduce visuals. 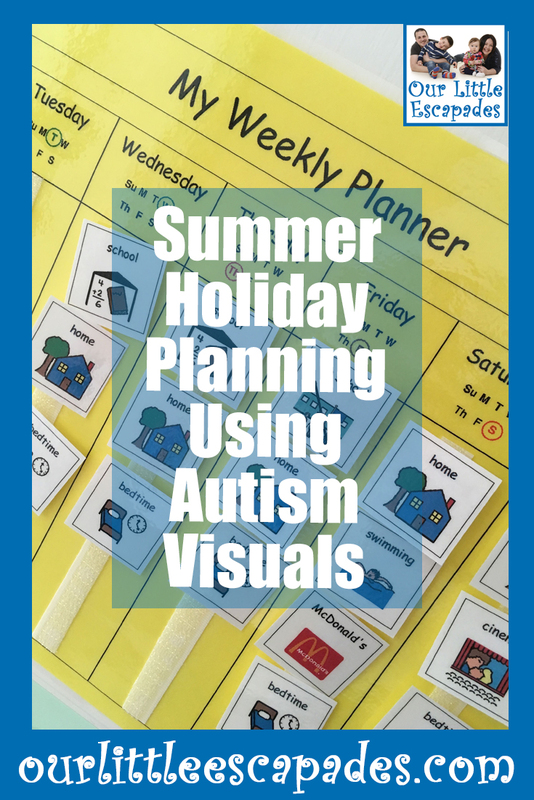 This means we have to do all of our summer holiday planning using autism visuals but if it helps Ethan it is worth it. I have made visuals for Ethan in the past but it is a very time-consuming activity. I searched on ebay for autism visuals and there are lots of options to choose from. I decided to buy Ethan a weekly planner. 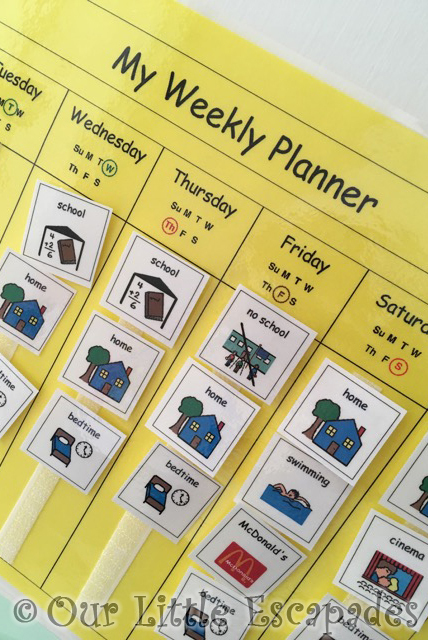 I also purchased another daily planner as Ethan is aware of the dates and days of the week. I also ordered a visual to help Ethan get ready in the mornings as we are also having those battles at the moment. I introduced the calendar to Ethan before the summer holiday started. He really wasn’t happy when he saw it. He spent ages looking at it and you could see his little mind taking it all in. He started to get upset by it so I had to tell him it was for me and it was staying where I had put it. Thankfully Ethan is now comfortable with calendar being up in the house. As soon as we get up we have to change the day and date on his daily planner. I have to try to be one step ahead of him so that I have the correct visuals ready. I’m not that organised yet! Have the visuals helped Ethan? I think they have a little bit as he knows what he is doing each day but it isn’t the miracle cure to our sleepless nights. At the moment I’m running on two hours sleep and most people haven’t even started their day yet! Ethan is full of energy and needs to get out of the house and be kept busy. This doesn’t happen everyday due to life but we will try our best to keep his as busy as possible over the summer. I feel for you…. I have been there and done that. I started using the ‘same but different’ concept many years ago and it has helped tremendously. Nick is no longer bothered by change and no longer needs a routine.